OTOC leaders were greatly cheered that the Nebraska Unicameral was able to clear last minute efforts to filibuster LB 623 which grants Dreamers who have been granted a temporary federal status the opportunity to apply for a Driver’s license in Nebraska. 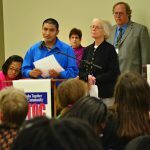 According to Kathleen Grant, OTOC Immigration Action Team Chair, “It is high time that the State of Nebraska afford these young people the opportunity to legally drive to their work, school and home. They are part of the bright future of our state and by not allowing them to drive in our state, we are driving them away from our state. Grant, Gaspar Gaspar and other leaders of the OTOC Action Team asked 9 candidates for the Unicameral to support this change in law at an OTOC Acountability Session attended by 300 people back on October, 6, 2014. 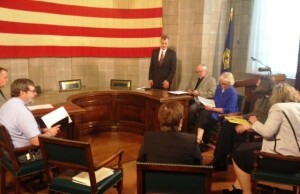 OTOC leaders also met with Governor Ricketts on March 31 to ask that he support this change in state law. Supporters of Legislative Bill 623 had to wait out eight hours of debate before 39 of them voted to cut off a filibuster.